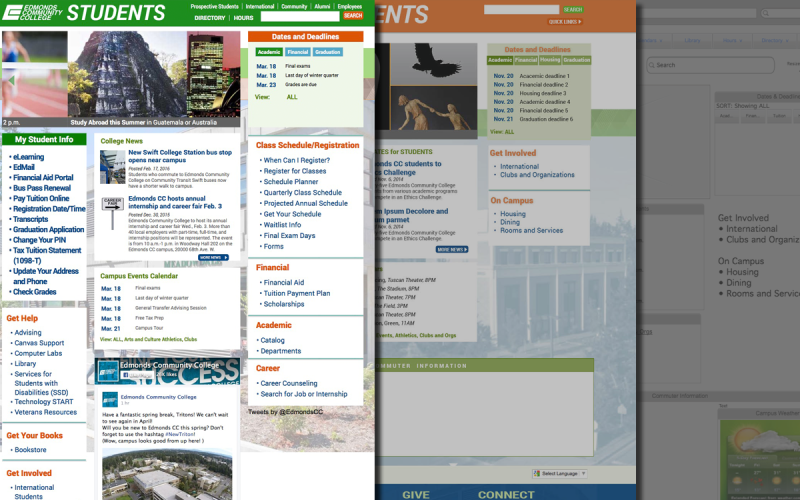 A student portal was designed for EDCC as an entry point for students. It gives them the ability to sign in to their class, financial, email and other campus systems. Also, the portal provides weather alerts, upcoming academic and financial dates and deadlines, traffic updates and regional weather for the many commuters coming to campus, news and events pertaining to students. Kanner Kreative performed user research for the main site and gathered information on what would be most useful for a site geared toward current students. Working with the Web Team at EDCC, bringing in higher education best practices, Kanner Kreative came up with a gateway that engages with students, is all-encompassing and gives the college a valuable communication tool.